Great breakfast! Comfortable beds, clean bathroom and close to the train station! Very close to all the sights! Ill be back for sure! Great value for the price! Breakfast was more than I expected for hotel food and was nicely presented. Room was clean, sheets and towels were soft. Our room was facing the stairwell so it was a little noisy but nothing unbearable. Location is awesome too, right by the Old Town and a 15 minute walk to the Jewish quarter. Highly recommend! Blue Aparthotel was the perfect choice for our stay in Krakow. We got the room 302 with the backyard view. The room was very clean and cosy. Heating worked perfectly. Location is excellent, 500m from the main square and all main attractions are within walking distance. Breakfast was good, we got lunch packs as we had Auswitch tour very early in the morning. The staff is very friendly and kind! Very good value for the money! The bed was comfortable, as well as the location close to the station. Centrally located, within walking distance of all important landmarks in Krakow and train station. Rooms were clean and staff very friendly and always ready to help. Room temperature was perfect; not freezing and comfortably warm. Location, location and location. Everything is nearby and very easy to find this gem of an hotel. Nice staff. Didn't take breakfast as had to catch an early train. But the nice girl at the reception had a mini b'fast packed for me. The staff was great !! Location is the best, close to everything !!!! Location to main square and value. Breakfast was excellent as well. Lock in a great price for Blue Aparthotel – rated 8.4 by recent guests! 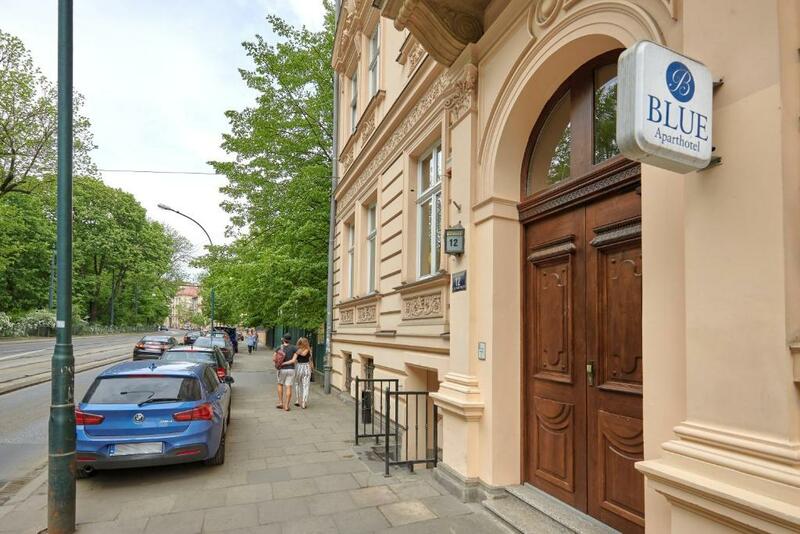 Only 4 minutes' walk from the Main Market Square and 6 minutes from Krakow Railway Station, Blue Aparthotel combines an excellent location with affordable rates. You can choose between brightly decorated, air-conditioned rooms with private bathrooms complete with a hairdryer. They all feature a flat-screen TV. A refrigerator and a tea/coffee making set are also offered. Cleaning service is provided daily. Breakfast is included in the price of your room and Wi-Fi is free. Blue Aparthotel is open 24/7 and features a elevator. Laundry facilities and airport shuttle are also available. All the attractions and entertainment of Krakow's Old Town are within easy walking distance of Blue Aparthotel. When would you like to stay at Blue Aparthotel? This bright carpeted room has TV and a private bathroom with a hairdryer. There is also air-conditioning and a refrigerator. This room has 2 windows on the ground floor, a TV and a bathroom with a hairdryer. There is air-conditioning and a refrigerator. This bright carpeted quadruple room has 4 single beds and a bathroom with a hairdryer. There is also a refrigerator and air-conditioning. Warmly decorated and carpeted room with a private bathroom complete with a hairdryer. There is also a TV, a refrigerator and air-conditioning. This apartment has a seating area, air conditioning and a bathroom with a hairdryer. There is also a refrigerator and a TV. This family room has a seating area, air conditioning and a bathroom with a hairdryer. A TV and a refrigerator are also provided. This larger twin room features a seating area, air conditioning and a bathroom with a hairdryer. There is also a TV and a refrigerator. House Rules Blue Aparthotel takes special requests – add in the next step! All older children or adults are charged PLN 50 per person per night for extra beds. Blue Aparthotel accepts these cards and reserves the right to temporarily hold an amount prior to arrival. The breakfast was OK but no fruits. The reception was polite, the rooms were very nice, the location is perfect. I recommend it. Good breakfasts, helpful and friendly staff, quiet room, excellent location for exploring old town. The location of the Blue Aparthotel is perfect: close to a train station and very convenient for walking sightseeing tours. The room is spacious, tidy,clean and quiet( tea,coffee,sugar,mineral water are provided free). The room is comfortable for relaxing after an enjoyable day of sightseeing. Breakfast is tasty, assorted and substantial. Seems to satisfy all tastes. The staff at this hotel always gives you a warm welcome! Able to clearly hear other guests in the hall late at night. Everything was excellent apart from the weather. By mistake I made reservation for 2 rooms but wanted for 2 people. I didn't notice my mistake. I was told by the receptionist about my mistake after I arrived to hostel. I ask receptionist to cancel on room because it was mistake. The receptionist said that he will talk with owner about my problem. When I went to my room I send information about my problem to owner. Owner wrote mi back saying that cancellation of one room is not possible and I must pay for 2 rooms. I ask him if he understands that I don't want to cancel both rooms and I stil want to have one room like I planned, but making reservation for second room was newer my intention so from my point of view he should give return my money for second room especially that his hostel wasn't fully booked so my second reservation did not cause lost in owner's profits. Good breakfast, big variety of food. Breakfast was nice and room quiet big. The breakfast was really poor and inside the room you can hear a lot of noise from the outside. The best option for the price, right next to the old town and train station. Had to keep going upstairs to reception to ask desk clerk to come to bar to serve drinks. Good location. Value for money. Friendly helpful staff.